Hello dear friends! Athanasia here today to share the third project of the trilogy ‘Color Your World’ I decided to do this month. This idea came to me because of the April’s color challenge pallet which has all these amazing bright colors. This time I wanted to make a retro style project on an A4 canvas. I chose a black and white photo with a ballerina holding an umbrella, and from that umbrella I got the idea to make colored rain. First, I applied some light paste with a mask, I spread some Geranium Coral Bluch embossing powder directly on it, and heat it with the heat gun. Then, I got charcoal and made some shading here and there on the page. After that, I glued the photo on the canvas, and with my drawing pencil I drew on the canvas the tips of the shoes and umbrella, which are missing from the photo. I also drew some lines on the left side to expand the wall of the photo onto the canvas. The last thing to do was some stamping on the photo, and the canvas, and glue a tiny butterfly on the ballerina’s shoe. After all that was done, the fun part with the colors began! I used all the colors of the April 2015 Color Challenge Spray Set plus the Tilt A Weel Teal, Raspberry Lemonade and Merry Go Round Green magicals from the Under the Boardwalk set. I made a lot of splashing and blending all the colors together with some stamps – it was really a fun process! I also glued a big flower and painted it with all these colors. I let the colors drip on the umbrella and the tittle and I really love this effect! So, that’s all with my retro project today! I hope you got some ideas and are inspired to have fun with color too! 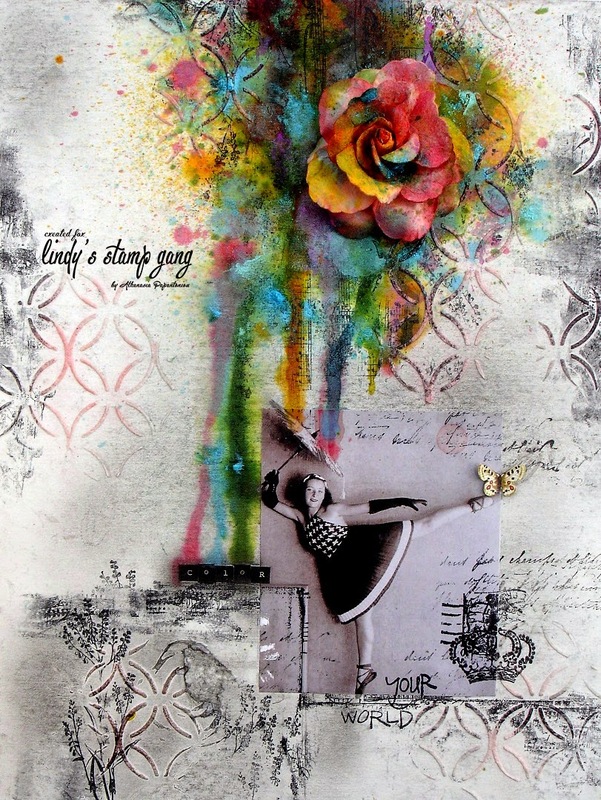 Art Journaling with Drop Dead Diva Magicals! Really lovely. Can’t wait to try this. Thank you ladies!!! I’m very happy you like it! This is absolutely amazing Athanasia! I adore the splash of colours! Ohhhhhhhhhh – wowowowowowowo – LOVE your colored rain Athanasia – that is just beautiful. You totally brought those colors to life…. wow. j.
Anathasia I am in awe of your talent! What a beautiful piece – the colored rain is gorgeous coming down on the ballerina! The color rain with flower in center looks AMAzing !